BRISTOL - Bunty Ray is tired of talking about last year. For the first time in his tenure as the Bristol Central baseball team’s head coach, the Rams failed to make the state tournament, finishing 7-13 last spring. That marked the first time the program did not advance to the postseason since 1998. But that’s all in the past. The Rams took their lumps last season, many of them coming in agonzing fashion. They went 2-6 in one-run games. After reaching a 7-9 record to get within one victory of state tourney qualification, they lost their last four games - including two losses by one run to Avon and the final defeat of the year, 12-11 in nine innings on a walk-off to Platt. Those were painful failures, but it’s those types of learning experiences Ray believes will become benefits throughout 2019. All of the things the Rams’ young core players went through last season mentally and emotionally, Ray says, are paying off four games into this campaign. He’s watched his team grow up right in front of him, and on the sidelines, Ray has been more calm than he has been at times in the past. That’s because he doesn’t have to harp on attitude and effort with this team. It’s a veteran-laden bunch led by junior catcher Jake Santiago and seniors Jaylen Dias, Alec DiLoreto and Ryan Rodriguez, the latter two of whom are battling injuries. When your best leaders are also your best players, the coach says, it’s much easier and smoother as the year progresses, and it makes Ray’s job simpler. He doesn’t need to do anything other than teach the fundamentals and nuances of the game, instead of having to beg for leadership. And that’s led to a bit of a switch up for Ray in terms of his coachings persona. 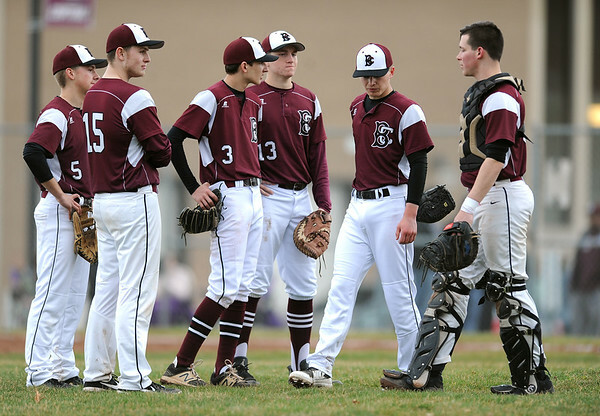 After back-to-back wins over Maloney (22-3) and Plainville (11-1) to start the season, the Rams (3-1) suffered a heartbreaking 1-0 walk-off loss to Hall on Thursday. But they got right back to business on Friday, securing a 5-0 bounceback victory over Newington. It’s a win Ray hopes could serve as a springboard and increase his players’ confidence as the intensity of the season ramps up. Coming back to lock down a big win less than 24 hours after such a debilitating loss was exactly what Ray was hoping to see. “Through failure you start to see who’s gonna go in the positive or negative direction. This is a game built on failure, and the guys who can handle it are the guys who are gonna succeed,” Ray said. “There’s a lot to play out. It’s still a young season. The good thing is we came off a tough loss and were able to get a great win against a quality team. Posted in The Bristol Press, Bristol Central on Sunday, 14 April 2019 21:03. Updated: Sunday, 14 April 2019 21:06.